The answer? You do it because you’re Greg Denton and Gabrielle Quiñónez Denton of Ox, and you do it by making the basics, executed with panache and a whole fuckton of butter. 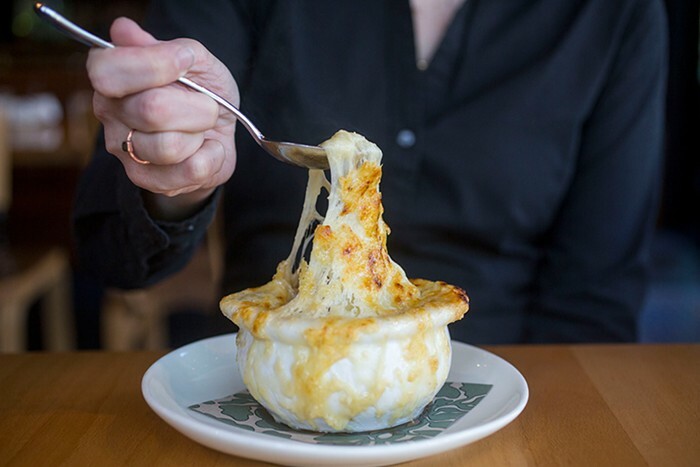 Bistro Agnes, named after Greg’s grandmother, is the third iteration of this West End restaurant space in as many years, with the Dentons taking over after alpine-inspired Gruner closed at the end of 2015. First they tried out SuperBite, a passion project of conceptual small plates that I loved, but ultimately it didn’t catch on. But if SuperBite was a kitchen where the Dentons toyed with dishes like the French classic coq a vinby wrapping duck hearts in bacon and floating a liver-slathered toast on morel-infused red wine sauce, Bistro Agnes plays it straight, serving chicken braised in red wine with new potatoes and mushrooms for $18 every day at lunch. Apparently Bistro Agnes is the approach the good people of Portland crave, as a recent Friday lunch visit saw the entire dining room booked out for the day, with seats only open at the bar. And just like at the wildly popular Ox, expect to wait for a dinner table if you don’t book ahead. Start with a cocktail or three, since the drinks menu outpaces the wine and beer list by a mile. There’s a dedicated absinthe list, and a great French take on Tiki, pairing rum and spiced pineapple with chartreuse ($14). And the super fun Dirty Grandma Agnes ($12) pairs unfiltered vodka with pickle brine for the dirty martini twist you didn’t know you needed alongside your perfectly medium-rare pepper-crusted filet mignon ($36). No matter when you visit, an order of the French onion soup ($12) must be de regueur: It’s the beefiest of beef stock soaking into thyme croutons and buried under what seems like at least an inch of cave-aged gruyere that’s browned enough to make crème brulée jealous (which is on the dessert menu, BTW, and also super tasty). Likewise, the Salade Lyonnaise ($13) is a must-order, with escarole and frisée lettuces and fat brioche croutons softened by a warm bacon vinaigrette that hits all the salt/fat/acid levels. Definitely order it over the simpler butter lettuce salad ($9), which needs more oomph. While the décor didn’t change much from SuperBite, very little of that menu remains at Bistro Agnes, save the incredible truffled macaroni with Parmesan cheese, for which I developed a minor obsession. It’s now nestled under a pan-roasted chicken breast ($26), which is very good—but I still dream of a giant bowl of truffled macaroni served to me at 2 am. I highly recommend having a leisurely, expensive (and hopefully reimbursed) lunch with a glass of bubbly rosé and sharing the Croque Madame ($13). It comes complete with the iconic ham, gruyere, and thick-AF mornay sauce, which Greg disclosed they also spread on the inside of the brioche before griddling the whole shebang and topping it with an over easy egg. The result is insanely rich and really freaking delicious. Bistro Agnes succeeds by turning the dial up to 11 on dishes familiar to any Francophile, so quibbles—like an order of coq au vin with chicken that was a touch too dry, or that the truffled bordelaise sauce poured over the wagyu beef cheeseburger ($16) was just too messy for the bun to withstand—are minor. Along with those little issues, I’m also a little bummed that the decadent French style of cooking doesn’t really allow for the Dentons to go veggie-forward, which is a highlight at the ostensibly meat-centric Ox. Yet looking at early feedback and consistently packed services, I’m guessing Bistro Agnes will be around for a while to come. Lunch: 11 am to 2 pm daily. Dinner: Sun-Thurs 5 pm to 10 pm; Fri-Sat 5 pm to 11 pm. Reservations accepted/recommended.